A new dance production inspired by folk tales from Dorset, Somerset and Devon. Trapped in a living state of limbo, Jay is controlled by her over-protective sister on one side and drawn to an intriguing creature offering her a sense of freedom on the other. Folklore is a tale of confronting inner fears and the struggles we go through with ourselves and loved ones. Original recorded music composed by Ninebarrow. 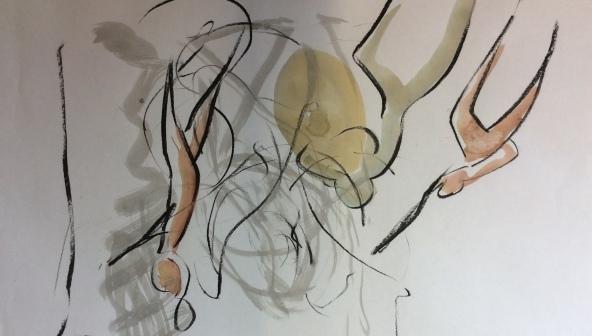 Fran’s sketches capture the energy and mood of the performance. To learn more about our residency programme contact Joel or Eloise.